is so much dominant in its existence one can hardly deny its occupancy and possession. Since the land is acquired with many fold forms of sublime artistic manifesto but establishment of Porattu Natakam, which is a theatre of dreams for dramatist is really a brilliant initiative. The meaning of Porattu Natakam indicates the importance of frolicsome theatre and it relates the significance of art by complimenting it with its undying contribution. Settled at a site of Palakkad district this is one of the most prominent Malayalam theatres although it is somewhat similar to the Kakkarisa theatre which is at southern site of kerala but this stage has its own colours and importance. The theatre is an open field and one of the most secular theatre in India and here various art forms comes and play their part to show their skills and to bag an appreciation and applauds from an audience. When I say secular it refers to the system which denies the bars against cast system because the entire work and field share is entitled to Panan caste, which is renowned for their melodious tracks and songs. Story telling which prominent side of art is done by Panan caste. Amazing stages which are built at a site of paddy fields is acquired by audience who runs down here in summer after they are done with harvesting process. Being a traditional site this platform conceives higher potency and importance which reflects their social structure and stratification. 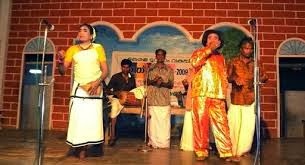 The characters which are played in this stage relates prime story of our daily life and some of the roles which can be consider as a bond of your schedule routine are Vannan and Vannathi, Kuravan and Kurathy, Komali and Pukkari. The stories which are played in this traditional stage reflects the social life and dramatist tries to cultivate a new seed of critics to employ change in our rustic life. All the performance starts usually at 10 pm and before that we could witness introductory session of music which they call it Keli in their common verse. Here you will see separate auditorium for performer and audience and music that unveils the beauty of programme are really very delightful. What is more amazing about the drama is, there comes a part when performers are embrace with question by main musician and they have to answer and this session adds more focus in the whole concert. The story which they try to relate, all comes from the shore of fun, lampoon and social disapproval. Instruments that are used to display the beauty of dramas are double-faced drums, cymbals, drone and two pieces of wooden that mark timing of whole drama. Stages are developed in such a way to capture the heart of an audience and they enjoy it thoroughly because somewhere down the line they feel the pinch of sacrilegious of social structure, so it is loved and allured by all.